Over the years, people -mostly children- have been killed and maimed by landmines. It is estimated that there are about 110 million active landmines, in other words, there is one landmine for every 17 children (or every 52 persons). Besides, 110 million landmines are stored ready to be used. These underground bombs can be found in over 70 countries, and about 2,000 people are involved in landmine accidents every month – one person every 20 minutes. Around 800 of these will die and 1,200 will be maimed. Many attempts have been made to dig up and deactivate this hidden threat, but unfortunately, it is not enough. And it will never be if the same basic landmine detection and old neutralizing theologies in removing anti-personnel landmines keep being used. 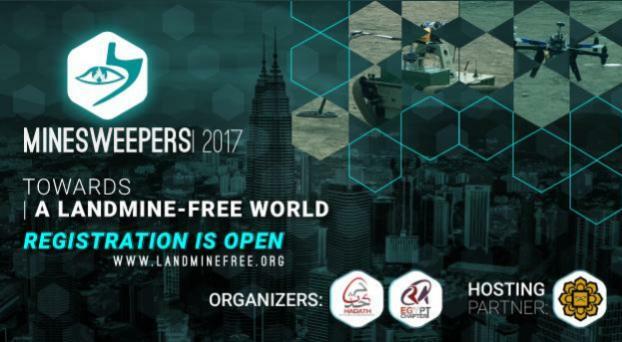 And here begins the role of the Minesweepers, the first international outdoor Robotic competition on humanitarian de-mining. Minesweepers” is an international competition that was first held in Egypt in 2012 and 6 years after it has been hosted in many countries, including Portugal, Chile, Egypt, and Malaysia. Minesweepers aims for a civilian-purpose demining or humanitarian demining by finding and removing abandoned landmines without any threats to the human nor the environment. Landmine technology has improved dramatically but no improvement has been seen for decades in the conventional detection methods since the removal procedure of great numbers of landmines is still very slow, inefficient, dangerous and costly. The solution lies in finding new ways of de-mining, which is now possible thanks to the application of new technologies and new Robotic systems that can provide an efficient, reliable, adaptive and cost effective solution for the problem of landmines and unexploded ordnances (UXOs) contamination [IEEE-RAM2015]. All that and more can be found in Minesweepers competition, aiming to raise the public awareness of the seriousness of the landmines and UXOs contamination and the role of science and technology in solving such a global issue. If you want to be part of the solution, then Minesweepers’ competition is made for you. The registration is still open, for those who are interested, go hit the link www.landminefree.org for more information, also send your questions to world@landminefree.org, and do not forget to follow the Facebook page for updates. Do you enjoy competitions? Check out the engineering challenges ennomotive has prepared for you.